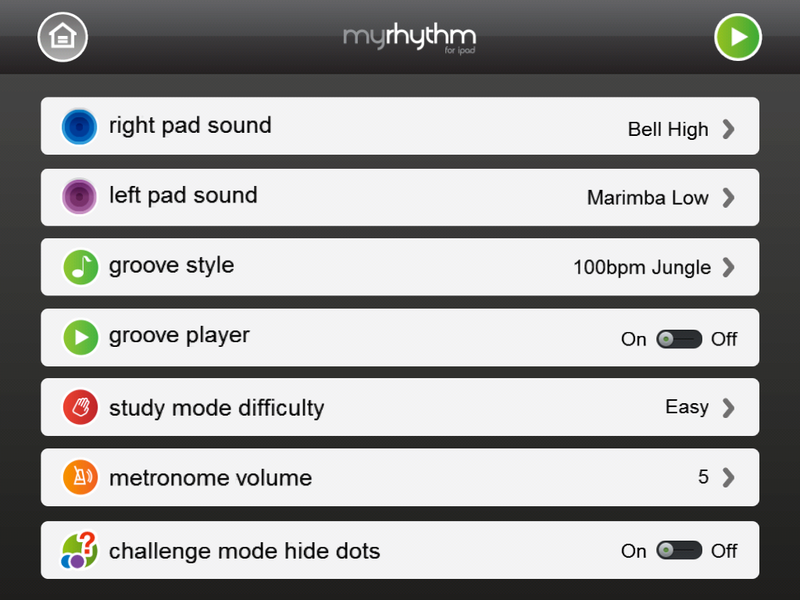 There have been several apps that help practice and learn rhythm concepts the past few months. 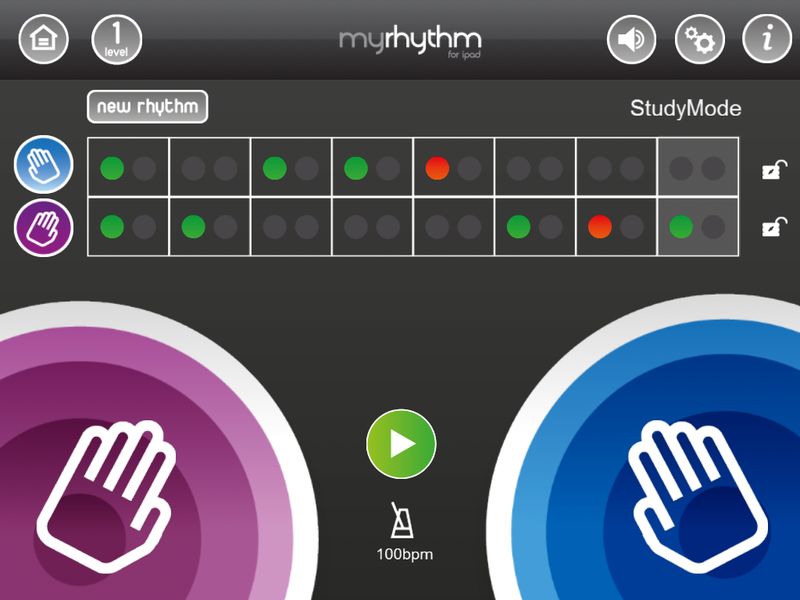 MyRhythm, from Gregory Burk, is an app that helps you practice your rhythmic skills, co-ordination, listening skills and memory. 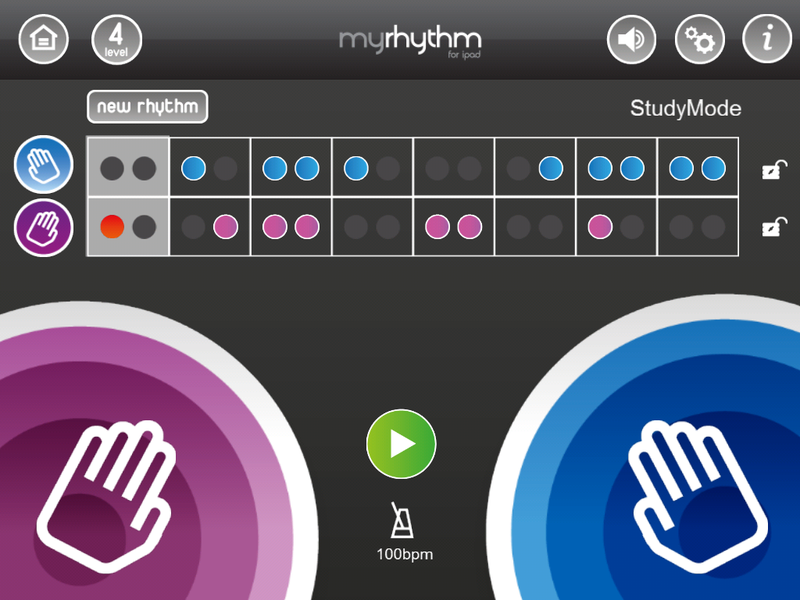 MyRhythm is full of features that anyone from a non-musically trained person to someone who is is music classes will appreciate. 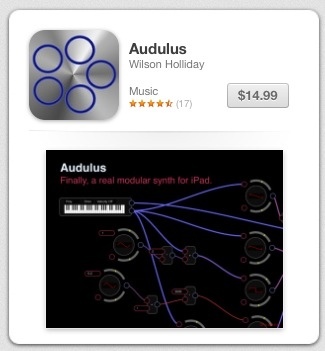 The app does not use traditional musical notation to show rhythms. It simply uses a grid of dots that are filled in, or not, to indicate whether you should be tapping the large pads in time with the groove that is being played. When you start up the app there three main modes you can go into… 1)Challenge Mode 2)Study Mode and 3)Creative Mode. The screen shot you see to the right is about the same in any of the three modes. In challenge mode you listen to and watch a pattern being played then the little violet and blue dots are all taken away and you have to play back what you just heard. It’s an answer and call mode in other words. In the Study mode the idea is the same except that the violet and blue dots do not go away and you can still see them and you do not get to listen to the rhythm being played first. Then in the creative mode you are able to create your own rhythms. It is in this mode that you can do another time signature besides 4/4. In the other modes all I found were 2 measures of 4/4. Of course no where is there ever any mention of time signatures in this app. There are four levels of difficulty to play around with. No matter which level you are in the timing algorithms being used to decide whether or not you are playing the correct rhythms are very strict! It is not good enough to simply hit that pad “close” to the rhythm! You have to really get into the groove and sub-divide so you are accurate! Mentioning grooves…. there are options to play along with simply a metronome or a very long list of different grooves at different tempos. Gregory did a great job of making sure there was enough variety here to keep you interested and challenged for a long time! I like the fact that there are many options in this app…. the different grooves, the call and answer, the creativity section, the ability to change several levels, the choice of what sound you hear when you tap the pads and how easy it is to quickly tap the new rhythm button to try the next rhythm. Even as a band director I like the co-ordination skills this builds even though my kids don’t always need to use two hands to play rhythms in class. I think students will find plenty in this app to keep them interested. There is an iPod/iPhone version of the app as well. I don’t like that this app only deals with 8th notes. As a music educator I don’t like that music notation is not used and yet at them same time I think there is a place for this type of graphic notation in a music class. Another slight issue I have is that I am pretty skilled at rhythm and I have to work really hard to get all the notes green! Now, maybe this is because I’m not as good as I think I am at rhythm BUT I KNOW what I am going to hear from the kids! 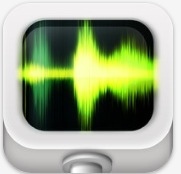 No, seriously though, I do believe the app has a little bit of issue “hearing” correctly played rhythms sometimes. Wish list – I do wish there was a way for my students to keep score of their progress as they work with this app.